Today we'll print a model that is particularly good for a first-day print in a 3D-printing class: a Penny Trap. Halfway through printing you Pause the printer and insert a penny into the model. Students love doing this, and it's a fun model for them to take home and show off to their friends and family after class. The Penny Trap a great example of the difference between the additive nature of 3D printing (where a form is built up from nothing) and the subtractive nature of other manufacturing methods (where forms are cut out of existing blocks of material). With subtractive manufacturing it would not be possible to construct this model, because the penny cannot be inserted through the holes. However, with additive manufacturing we can add the penny during the print, forever trapping it inside! 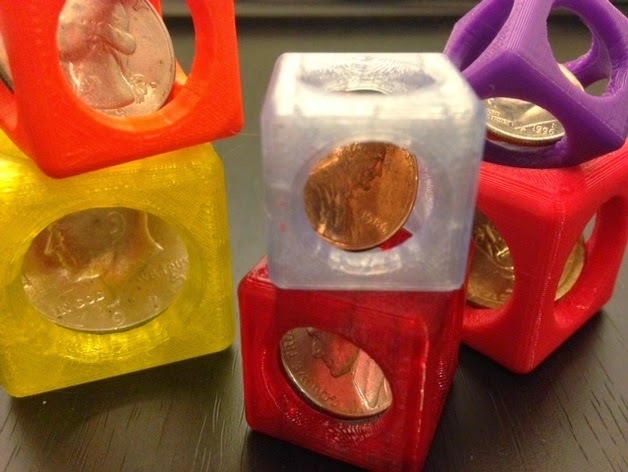 Going further: If you want to make traps for different coins, you can find models sized for many major currencies, or even customize your own, with the Customizable Coin Trap model on Thingiverse. Pro tip: Coins, especially pennies, can get really dirty. To clean up your coins, soak them in vinegar for a little while.